I love my fried egg a couple mornings of every week. I start off by throwing in peppers or green onion along with a little olive oil. Once those get cooking, I fry an egg on top. It makes it sooo tasty! Great idea! I love green onions and fried eggs. Never thought to combine them. 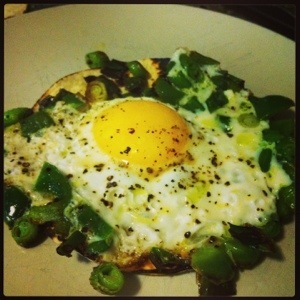 These fried eggs are my favorite and I often switch up what I serve them with. It’s easy to add the onions to your oil and then fry the egg on top. I make them a couple times a week like this.